i-MBA supports the “Athens ExtroVision Forum 2016“, which will take place at the HERMES hall of the Athens Chamber of Commerce and Industry on Thursday, April 21st 2016, 17.00 – 20.00. The main subject of the Conference, which is organized by the Hellenic Institute of Entrepreneurship & Sustainable Development (IEA), is the «Extroversion of Greek entrepreneurship: Vision & Reality». Its organization is based on the standards of ISO 9001, ISO 14001 and ISO 20121. The conference focuses on the dilemmas of entrepreneurs with regards to starting a new business in Greece and/or abroad, as well as on all relevant functional, intellectual property, financial and tax issues that an entrepreneur might face. It aims to demonstrate the potential and flexibility created when an enterprise participates, via a synergy, in business networks, both within and across borders, responding to the question whether the extroversion of Greek enterprises is the only opportunity to their further development. Additionally, there will be a discussion on issues concerning the Greek business culture as well as the legal and general regulatory framework for enterprises and corporate governance. Presentation of Greek Legal Forms & Synergy and Networking Models of Greek enterprises. Financial & Tax Issues of Greek Legal Forms & Synergy models. Trademark, Patents & IPs: «the Company’s Treasure». Innovation, RnD and e-Business as “Made in Greece” products. Success Stories of Greek Legal Entities & Synergies. The Conference is addressed to entrepreneurs and companies with extrovert strategic and investment policy, potential entrepreneurs, senior executives of Greek and International Private Sector, institutional delegates, senior executives of Greek Public Organizations, Foreign Ambassadors and Commercial Attaches, Financial Institution Representatives, academics and experts. The conference topics will cover the current trendsin the design of energy markets, the modern financing techniques in energy with emphasis in sustainable development, the new technologies in power generation and energy management along with the best practices in energy projects development. In parallel, the opportunities and risks in energy business will be analyzed taking into account the high volatile economic environment in Greece today. The conference will be attended by many business executives, entrepreneurs, policy officers, diplomats, academics and researchers from energy, construction, shipping and consulting sectors. This event is free of charge. The conference will start at 17:45. Supporters of the conference: Hellenic Association of Energy Economics, Greek Energy Forum, the MBA International Alumni Association and HERON Group. generation and energy management along with the best practices in energy projects development. volatile economic environment in Greece today. academics and researchers from energy, construction, shipping and consulting sectors. International Alumni Association and HERON Group. 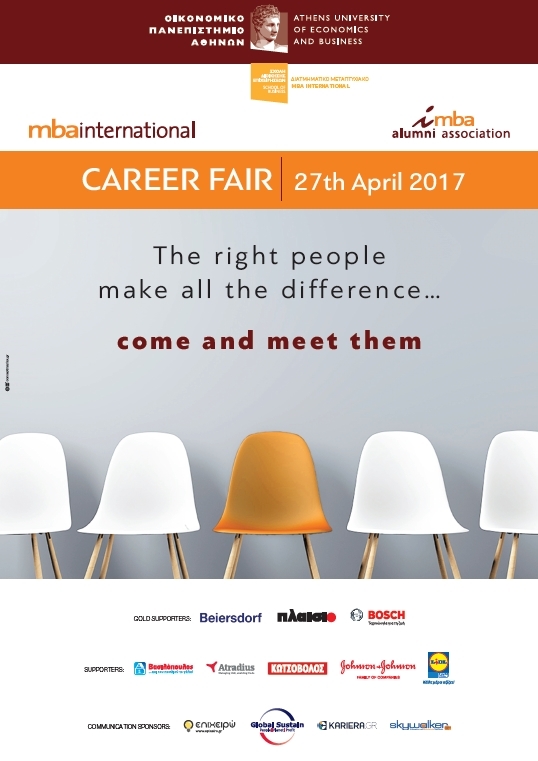 The MBA International program, in collaboration with the i-MBA alumni association, organizes its 13th annual Career Fair with the participation of some of the biggest multinational and Greek companies. The event will take place in the “Olympia” hall of Royal Olympic Hotelon Thursday, 21st April 2016, 10.00 am to 7.00 pm. This year the number of participating candidates will range from 120-130, while 41 companies will be there to recruit them.